I have mango tree in Dubai which is full grown. many green mangoes are hanginging from it. 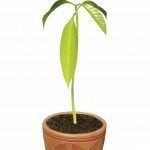 when the mango gets ripe ie slowly yellow --- it (the mango) develops a black spot . then the mango slowly gets rotten. (we don't spray too much pesticicde cause the skin of mango is very thin) . 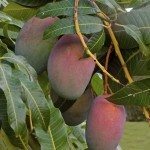 How to stop the mango from developing the black spot and get rotten . appreciate ur help. [email protected] . thanku. This looks like it could be sap burn. These articles have more information.